Has LG really made a smartphone users want? On February 26, we welcomed the arrival of the new LG G6. The smartphone offers important new features compared to its predecessor, has an unusual 18:9 screen format and has abandoned the modular design. This year the South Korean company has done its best attempt to create a smartphone that meets the needs of users. But was it a success? LG got so involved in the development of their new LG G6 that, during the official announcement, the manufacturer couldn't help but blurt out the news regarding the optimized software and the unusual display. The screen is the smartphone’s most distinguishing feature: it encompasses IPS-LCD technology, 5.7-inches diagonally, a thin bezel, atypical 18:9 format, 2,880 x 14,40 pixel qHD resolution, all within a unibody casing which, as we checked for ourselves at the event, can be used in one hand with no problems. The LG G6, notwithstanding the diagonal size, is smaller than the Samsung Galaxy S7 Edge and benefits from the maximum available space on the front of the device. To redeem itself from the poor LG G5, the South Korean company decided to renew its flagship device to meet the users' needs. Therefore, it decided to give the device an Android phablet feel with a minimalist design and by making it easy to use, which will please those of you that want a large screen to play games, read, surf the internet, etc. Other than the big screen, what else does it offer? The compact display and size of the device are not the only measures taken by the brand with the users in mind. The LG G6 has IP68 certification, a Quick Charge 3.0 charger, Android Nougat, optimized software, a promising camera and a mini-jack for headsets. 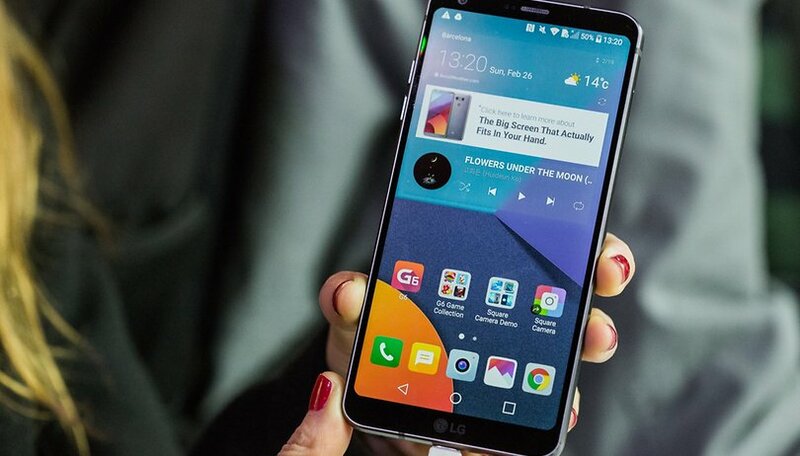 During the event, I met with Raffaele Cinquegrana, product manager at LG Electronics in Italy, who confirmed that the decision was made to abandon the modular concept, that was introduced on the LG G5, because they wanted to reach out to users' needs. The modular concept was innovative, but users didn’t like it as much as was expected by LG (whether because of its impracticality or the cost of the modules). That’s why the G6 does not come in modular form. The removable battery has also disappeared. For some, this may be a downer, but hopefully the increase of 500 mAh available compared to the previous generation, Doze mode and the quick charge technology will help ease the pain. The mini-jack for headsets is still present though. With certain brands (particularly Lenovo and Apple) having disposed of them, LG decided to keep it in order to provide a more rounded user experience. Wireless headphones and headsets are becoming more and more popular, but many users still use wired headphones and headsets. So why disappoint them? An alternative to the Galaxy Note 7? At first glance, the LG G6 is an interesting smartphone. Easy on the eye, with its metallic unibody made of glass and metal, plus, if you take a look at the technical specifications, the LG G6 was introduced as a safe and reliable device. A (indirect) reference to the Note 7 fiasco was made during the press conference in saying that the South Korean brand paid special attention to the battery and that various security tests had been completed. The LG G6 doesn’t include the latest generation in processors, but the Snapdragon 821, thanks to the software optimization, allows the smartphone to function without a hitch. Finally, users that were let down by the Note 7, read this: the LG G6 is ready to meet your needs with its large screen, IP68 certification, wide-angle camera and all the other features that the smartphone has. All without risk of it going up in flames. The absence of the Galaxy S8 at the MWC seems to have given an extra leg-up to the LG beauty. It’s price? So far, no price was confirmed for the US, but from what LG has unveiled in the past, we can bet it would be between $500 and $700. Now, we'll just have to wait and see what future LG G6 owners say. The brand’s expectations are high, following the disappointing LG G5 sales and with the effort made in creating the new generation. Is the LG G6 the smartphone that you’ve been looking for? Bla bla bla goes the fan boy again. I like the design of the G6. I really like the small bezel and large screen. Waterproof and having a headphone jack are plus's. I'm interested in the G6. I can afford anything I want. I just know what is a good phone you don't. Please do not comment on my post and I will not comment on yours. You obviously do not know what you are talking about you think the worst Note is the best. My note 4 will out perform your Note5 everyday of the week. this site really does not need a troll like you. Edit by Admin: Offensive remarks removed. Overpriced maybe but it's all relative. Look at the pricing of the pixels and iPhone and also the high priced predictions for the S8s. Then your getting an LG for less with flagship processor and specs that match those others. I'm going to say that with the lg you'll probably get more bang for the buck. There is a huge difference between "functioning without a hitch" and moving the game on. This phone is a lame duck. I don't think so, their latest LG G6 is still too big to state it as "large screen in compact size"
LG does make good phones I think The V20 is the best phone currently on the market today. I have the G5 and really like it. I love the way the battery swaps out. It was a great concept that was poorly executed, but still a good all around phone. I have no interest in all glass phones no matter who makes them, so the G6 is not on my list. I will be waiting for the V30 unless Samsung wakes up and brings the removable battery back to the Note series. If the V30 doesn't have a removable battery I think I will say F##K it to the smart phone market and buy a Nokia 3310. There's nothing wrong with an all glass design. I had an iPhone 4s that was an all glass design without a case. Dropped numerous times and the glass never broke. Just lucky I guess. But that's not a show stopper for me. But we all have our own preferences. The problem is glass is also an insulator. It just make your phone run hotter and it is more fragile than metal or fantastic plastic. The other thing is I will not buy a phone with out a removable battery. Glass on the back that ain't happening. Samsung is technology and Android they are the industry leader the manufacturer who everyone copies and are chasing to catch from a revenue standpoint and especially market share. Samsung doesn't have to wake up to anything that's why they sold 300 million smartphones in 2016 LG couldn't even sell 20 million. Bottom line nobody buys or wants LG products that's pretty plain and simple number never lie. I don't blame you for being jealous or ashamed that you can't buy legitimate quality you have settle for LG. You get what you give my friend. You aren't anything special nor are you anything significant in the real world. You're useless opinions or thoughts doesn't supersede anyone so get over yourself your not that important. Respect is and always will be a two way street if you don't give respect you won't get it that's plain and simple. And if you do have a Note4 get a legitimate job or life you've fallen behind the technology game that's pretty sad in itself. I suppose you think your something special well think again. We have our opinions you have the right to yours as much as I have a right to mine. Putting other down because they do not agree with you is what you are doing. That is what I have a problem with. You are replying to what I said if you don't like what I said MOVE ALONG. I have my opinion you have yours I don't need you thinking for me and you definitely don't Intimidate me. You got nasty so I got nasty. You online losers get tough but really aren't built for communication. If you don't like what post don't respond cause I don't think for you and don't need you trying to think for me I'm way ahead of you in every aspect. I only replied to you because you posted a reply to my post, or I would not have bothered with your mindless blather. I am not trying to intimidate you or any body else and I am certainly not intimidated by you. Your the only loser here buddy boy! I got nasty only after you posted your normal line that you give everyone who disagrees with you. For being nasty I will apologize for the rest of it no. Big screen? Come on, it has exactly the same surface area of a 5.5" screen with the usual 16:9 ratio. It means that you'll not have more content, just a squeezed video experience with 16:9 videos having black bars and actually occupying the same area of an even smaller 5.2" screen (because of how large it is). In the end, you'll have unused real estate and a taller, 5.2" smartphone. But hey, I like those front facing speakers and shock resistant metal body... just kidding. And you use your phone just to watch videos!? LG's history of slow updates and weak developer community for ROMs has kept the brand off of my radar. They tend to be overpriced too. The Android market is winning in the middle with Moto and OnePlus kind of designs maximizing real use without bloatware and bloated budgets. What I've seen is samsung is much slower with firmware updates than LG. For example the G5 have nougat and the V20 both received it Last year, samsung only rolled out nougat this year and half to three quarters of users world wide don't have it yet. The problem is some and/or a lot of countries don't sell the OnePlus or Pixel devices therefor we only have samsung and LG, it's either those two brands or a iphone, and I'm definitely not purchasing a iphone.